Mike Haley "2014 Local Hero"
Not just anyone can win a US Championship. But Mike Haley did it in familiar waters at his beloved Huntington Beach Pier in 1960 – just one year after his brother Jack claimed the first championship at the Huntington Beach Pier. The Haleys were originally from Seal Beach, but attended Huntington Beach High School and were part of the young, progressive group of waveriders emerging from that era. And while Jack went on to run a thriving surfboard business (which he later sold to Chuck Dent), Mike was more about chasing waves and traveling for surf. 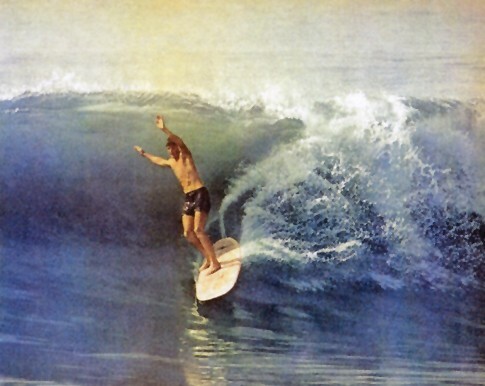 He and Corky Carroll were also amongst the first few guys to begin experimenting with twin-fins around 1970, working with legendary shapers Terry Martin and Mickey Muñoz. Haley has also lived in Laguna Beach, Maui, Alaska and Oregon over the years before settling down in Nipomo, California. He passed away of liver cancer in 2006. 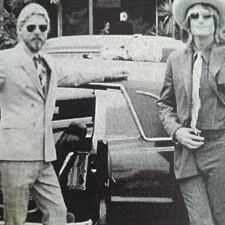 PHOTO: Mike transitioned into the ’70s as part of surfing’s cool crew, seen here with Mike Hynson outside the La Jolla Tennis Club. 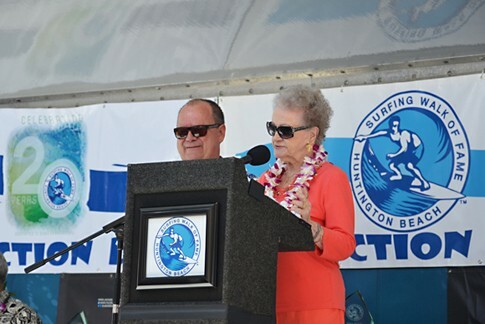 PHOTO: Mike Haley's Mother Virginia speaking at the 2014 SWoF Induction. Photo courtesy of Sharon Marshall. PHOTO: Mike Haley at Seal Beach, CA. 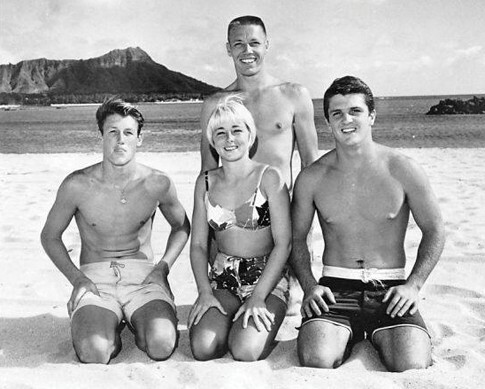 PHOTO: Mike, on the left, was part of the Hobie Surf Team of the early ’60s, seen here with fellow Walk of Famers the late Hobie Alter and Linda Benson, and Dave Willingham. Photo courtesy of Clarence Maki.